Delight your toddler with these great books! Home for a Bunny is one of our favorite books authored by Margaret Wise Brown, a master children's storyteller. The language is poetic without being too predictable, and speaks to children's feelings without ever condescending. Even abstract concepts like love, security, companionship, are addressed in a reassuring and beautiful way. The illustrator, Garth Williams, has accurately represented the wild life and plant life of most of north eastern North America. It is important to provide toddlers with exposure to realistic photographs, and also realistic artwork, not just cartoon images. Our little ones love the book because of the bunnies! This book is a winner because it addresses the entire pre-school curriculum in a fun way! Richard Scarry's Best Storybook Ever introduces numbers, the alphabet, colours, seasons, basic vocabulary of the world around us, hygiene and heath routines, and more! The artwork is cartoonish but bright and inviting. And it is a big long book: Toddlers can stay captivated for a long time while leafing through its 82 pages. We love teaching with this book, as the language is simple and encourages toddlers to repeat the sounds they hear. The artwork is wonderfully inviting, and there is a caterpillar to find on each page! 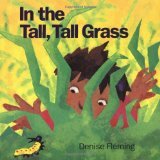 We used In the Tall, Tall Grass to stimulate production of certain sounds when our own young children needed speech therapy, and it worked. Therapeutic and fun! We love this book because the characters clearly think like toddlers! As you can see in the front cover, when the fish is hearing about his friend's adventures, he can only imagine within his own experience. Fish is Fish is a story about acceptance of friends as they are. It is suitable for older toddlers who can sit and listen to a story, and for littler ones who can see the story through the images. Visit again for more recommendations!